Our New range of bevelled edge, double sided light panels are ideal for a wide range of point of sale displays, from estate agents to Banks. 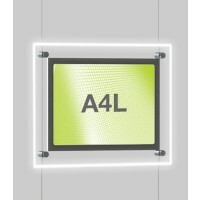 The low voltage LED lights mean that your display can stay illuminated for up to 100,000 hours! Not only this but the simple slot design means that the graphics can be changed easily - and you can print on standard paper or Backlit paper, greatly reducing your printing costs. 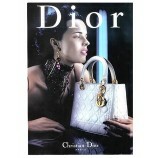 This Kit comes with all you need to create a stunning illuminated window display. Why wait, Order now! Finding the right advertisement screen among different options available isn’t easy. 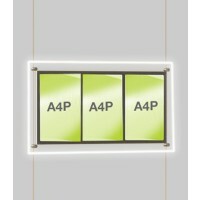 A4 Single Portrait Light Panel Kit from Discount Displays will let you advertise your products with clarity. This promotional tool is perfect to use during exhibitions or marketing events which will help entice the clients with ease. 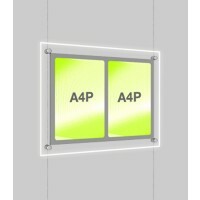 This commercial LED light panel is perfect for estate agents, retailers, salons, banks or business professionals who are looking to boost their presence. 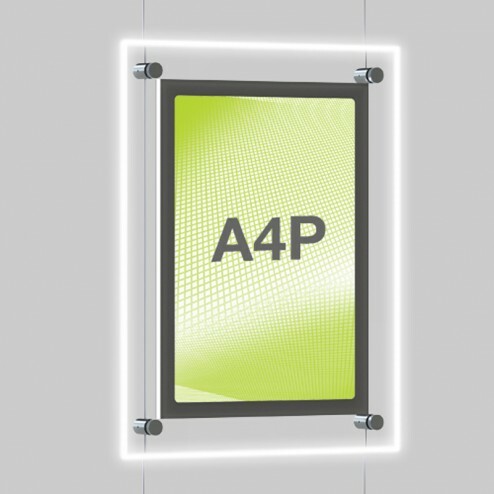 LED advertising displays features 4 clamps on the corners that will help you to secure graphics at its place. Advertising outdoor screen also includes a transformer and floor to floor ceiling cables with instructions manual and guided safety instructions to install or assemble the advertising tool with ease.